The KV-901T & AV-901R is a perfect solution to extend Audio & Video and RS-232 signals over IP Ethernet. The AVK-901 is a perfect solution to extend DVI/VGA with Audio & RS-232 signals over IP Ethernet. It is useful in a wide range of digital signage applications that require one-to-many, many-to-many distribution, such as: informational displays, corporate signage, boardrooms, courtrooms, train-station, shopping mall, medical, military, and school/college. Just simply attach the VGA/DVI and audio to the KV-901T transmitter, it starts to encode audio/video to the IP network. 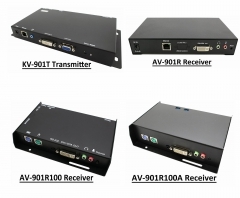 Just simply attach the AV-901R receiver; it starts to decode from the IP network to the monitor and speaker. AV-901R100A receiver built-in 10 Watt audio Amplifier. Support one-to-one (unicast) and one-to-many (multicast) mode for Audio/Video real time broadcasting. Also supports multiple- to-multiple mode for group broadcasting if the Ethernet switch has the IGMP snooping. Receivers can be configured as either in Individual or Video-Wall mode. Support available Transmitters list OSD menu for the receiver to select. Management software provides RS-232 command extension for remotely turn on/off displays, input source selection, volume control... etc. (Optional) Support IR bridge function, you can use the IR remote controller at Receiver site to control the set-top box at the Transmitter site. An optional manager software (AV-900S) can be installed on any Windows PC to manage the TX/RX connection and Video-Wall configuration.